When new students arrive in a yoga class they often have little awareness of their bodies. So it is our job as yoga teachers to gradually help them figure out how the body feels on the inside and how to control its position in space. At the same time, many new students have very little awareness of their breath, so it is our job as yoga teachers to bring their attention to the breath, help them deepen it and teach them how to use their breath to guide their movements. In yoga body awareness and breath awareness go hand in hand. What about the students’ minds? Many yoga teachers help their students investigate their bodies and regulate their breath, but stop short of helping them investigate and regulate their minds. Is the mind less important then body and breath? Not according to the yoga tradition. In fact, in the yoga tradition learning to control the fluctuations of the mind is front and center, while breath and body work play a supportive role. The point is that s**t happens (pardon my language) and when it does – will you be ready? And we are not just talking about major life shifts like childbirth, sickness, divorce or death. Confrontations, elections, job changes, interpersonal conflict happen all the time. Any change stirs things up, whether you like it or not, and it informs your emotional response, your behavior and actions. How well will you handle it when it happens? My very wise yoga student once said: “Your happiness depends on your ability to tolerate ambiguity”. Practicing meditation in the form of self-reflection helps us tolerate ambiguity. Nobody meditates for the sake of meditating. First we meditate to be able to see our lives and circumstances a bit more clearly, then to see ourselves a bit more clearly, and then to break free from our conditioned reactions that color our views of the world, and release the charge that triggers strong emotional responses. “So if I sit with my eyes closed for a while it will fix all of my problems?” Sort of. If you hook your mind to something and maintain that focus for an extended period of time, it will help the particles stirred up by change to settle, so that you could see a bit more clearly. There are different meditation strategies that you can use and we will talk about those next year. But, according to Patanjali, “Choosing meditation according to one’s affinities brings mental clarity.” Meditate on something that you enjoy and find meaningful and it will become something that you look forward to, instead of a chore. And if you feel that you need support or encouragement on this journey, tune in next week for a special announcement! I love this. I always lead a 15 minute meditation at end of each asana class. The positive change I have seen in my students is astounding. Thank you for reinforcing the importance of meditation. Thank you Mary! So happy to hear that you share this gift with your students! What a lovely piece to talk about with my students this morning. Olga, thank you for your thoughtful writing. great article! I love your writing…clear, concise, real. 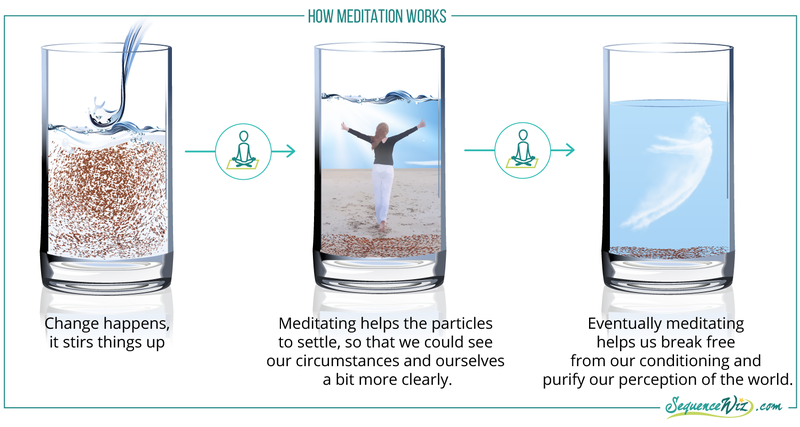 Thank you, Olga, for this timely (for me) reminder of how meditation helps to settle the agitation of one’s mind, and allows one to see more clearly. I look forward to more upcoming posts on meditation. The best classes I have taken (and taught) include at lease some period of meditation. Agreed! Especially now with winter and holidays it seems to be conducive to slowing down and turning inward. I love this image of a snow globe, Jill! It’s a great simple visual to explain a more complex concept – thank you for sharing! “Your happiness depends on your ability to tolerate ambiguity”… so wise! I wonder if that came to your student in a meditation 🙂 You are a wonderful writer and I am grateful you are able to and willing to share your insight with others. Thank you. I have had a meditation practice since 1974 and always find it hard to find a yoga class that will incorporate meditation into their class. It adds so much to have a yoga class that get the body ready for meditation. Which I believe is the purpose of yoga. Previous story Does yoga have its own approach to meditation?